Arca-Swiss style?…Bogen quick-release?…rotation collar?…Photo lingo can be a bit intimidating and confusing at first. We have put together some information to assist you while wading through these murky waters. A collar refers to a rotation collar, or tripod collar, that rotates on the lens barrel independently of the focusing ring and/or the zoom ring. This ring usually supports the L-shaped tripod mount, called a “foot”. 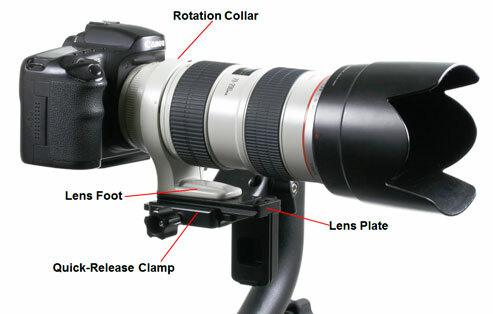 The lens collar and foot are attached and rotate together. The collar is usually tightened to stay in one position, but it can be loosened to change the orientation of the camera body from landscape to portrait or retightened in any position you choose. The images to the right demonstrate rotation of the lens within the rotation collar, in shifting from horizontal shooting to vertical. The lens "foot" is the L-shaped tripod mount. The lens foot has mounting holes that allow you to attach the lens to a tripod, monopod or ground pod. There are usually one or two mounting holes in the foot, depending on the size of the lens, and they are a standard ¼”-20 screw size, but on larger lenses one hole may be 3/8”. Without a quick-release (QR) system, you would have to spend a substantial amount of time mounting and removing your lens by screwing the lens foot directly onto the mounting stud of the tripod or tripod head. This can be a difficult and time consuming, especially if you use a variety of different lenses. Thus the QR and rapid connect (RC) systems were born. A Quick Release system consists of a QR clamp and a QR plate. The QR clamp usually has either a screw knob or a lever mechanism to release the plate, which allows you to quickly remove and mount the lens to and from the tripod. The factory, or “stock”, foot does not have the correct shape to mount it directly into a QR clamp found on most tripod heads. Therefore it is necessary to attach a quick-release “plate” of some type, to the bottom of the lens foot to connect the lens to a QR clamp on a ball head, the Wimberley Gimbal, the Wimberley Sidekick, or other tripod head with a QR clamp. There are different styles of QR clamps and they are not all compatible. 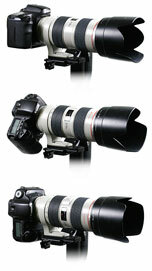 Bogen/Manfrotto has a Rapid Connect (RC) system which has a specific shape and size of QR plate. These RC plates are made so that they are specific in length and width to their corresponding RC clamp and cannot be used with any other clamp. There are also Arca-Swiss style plates, which are size specific in only one direction (width) and are more universal and can be used with most other Arca- Swiss style clamps made by most manufacturers. 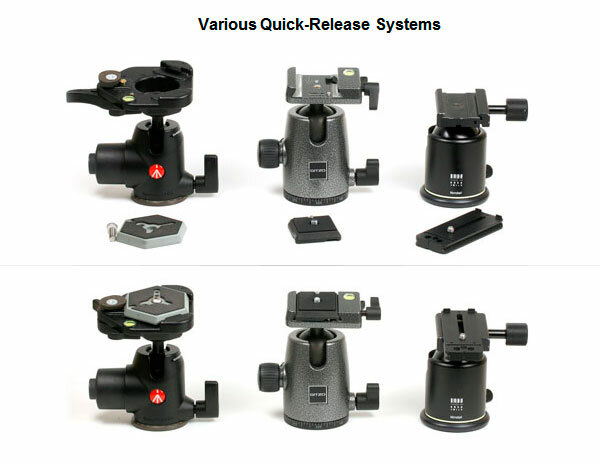 Wimberley only uses the Arca-Swiss style tripod head clamps and lens plates in our QR system. Your lens will need a Arca-Swiss style quick release plate to mount it to the Wimberley Head or Sidekick. Our lens recommendations can be found here. According to our chart, a Sigma 300-800mm lens takes a P-50 lens plate plus a BS-100 brass reducer bushing. One of the mounting holes on the foot of the 300-800mm lens is a 3/8” size, and since all our lens plate mounting screws are ¼”, a 3/8” to ¼” reducer bushing (the BS-100) needs to be installed into the larger mounting hole in the lens foot so that it is reduced to ¼” and can accept the ¼” screw in our lens plate. If the lens has more than one mounting hole, we highly recommend using both holes to mount the plate as this gives a more sturdy connection and prevents the plate from twisting on the lens foot. 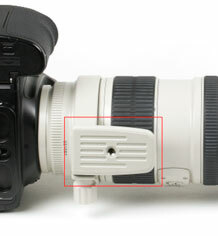 A replacement foot replaces the factory foot on the lens to reduce the height of the lens. When using specific lenses, those that have a high profile, a replacement foot is often necessary to achieve optimal balance when using our Wimberley gimbal tripod heads. When a replacement foot is required, you would remove the existing foot from your lens collar and attach the replacement foot in the same place. This is most critical when using the Sidekick or Sidemount version Gimbal. Refer to the lens plate recommendation chart, listed on the website, to find the plate for your specific lens. For more information regarding ball head and lens plate recommendations, refer to the Sidekick compatibility guide.